TAMPA, Fla. - Thanks to three fourth-quarter comebacks, No. 21 South Florida remains one of eight unbeaten teams in the Football Bowl Subdivision. Coach Charlie Strong just wishes the Bulls (6-0, 2-0), who can match the best start in school history by beating Connecticut (1-5, 0-3) on Saturday, didn't have to prove their resilience with such regularity. Down 10 at home to Georgia Tech, no problem. Double-digit deficits on the road against Illinois (12) and last week at Tulsa (14) weren't too much to overcome either. “They've gained confidence because of the way they've had to play, the way they've had to fight back in a lot of games,” Strong said, reflecting on last Saturday's 25-24 victory at Tulsa, won on Coby Weiss’ 22-yard field goal with 22 seconds left. 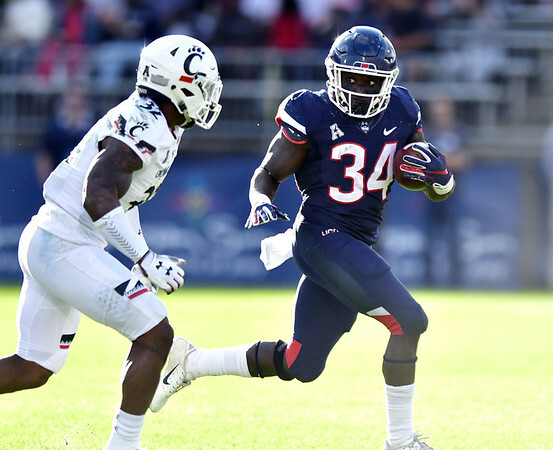 There's a good chance the Bulls, one of three unbeaten teams in the American Athletic Conference, won't need any last-minute heroics against UConn, which is rebuilding under coach Randy Edsall. The Huskies have played 35 freshmen or sophomores this season and are allowing 53.7 points per game, on pace to break the FBS record (50.3) set by Louisiana-Lafayette in 1997. USF has scored 20-plus points in 36 consecutive games, the longest such streak in the nation. And, UConn has yieled at least 49 in every game, including its lone victory (56-49 over Rhode Island). For the sixth time this season, the Huskies are facing an opponent that's undefeated at the time. That includes lopsided conference losses to UCF and Cincinnati, who like USF, are unbeaten and ranked in the Top 25. Edsall, who's in his second tour of duty as UConn's coach, says despite the fact the Huskies will lose just two fifth-year seniors after this season, he's told players they are not guaranteed a spot on next year's team. USF running back Jordan Cronkite is second in the AAC and third in the nation in rushing at 151.4 yards per game. The transfer from Florida has four straight 100-yard games, one shy of the Bulls record set by Marlon Mack in 2015 and matched by Quenton Flowers in 2016. The Huskies will take the field with teammate Eli Thomas in their thoughts. The linebacker suffered a stroke on Oct. 10 prior to a weightlifting session. Linebacker Omar Fortt wore Thomas’ No. 22 jersey in practice Tuesday, and Edsall says linebacker Santana Sterling will wear it during the game on Saturday. “We all feel like we are close to him, but that's a guy that he wants to show that this is my brother and we're always going to be behind him,” wide receiver Tyraiq Beals said. Running back Zavier Scott said the team is writing “a book of Eli,” putting their thoughts into writing, which the linebacker's family will share with Thomas. Posted in Newington Town Crier, UConn on Friday, 19 October 2018 21:18. Updated: Friday, 19 October 2018 21:20.